Display advertising is a form of interruptive advertising on the web. It refers to any ads that are superimposed on the user experience. Examples include banner or video ads that appear on the top, bottom or margin of a website or application, and interstitial ads that pop up before a web page loads. Native advertising, on the other hand, does not disrupt the user experience. The ad is embedded in the content or in some cases, is the content. Common examples include paid search, sponsored posts on social media, influencer posts and content listings on other websites via content syndication networks. 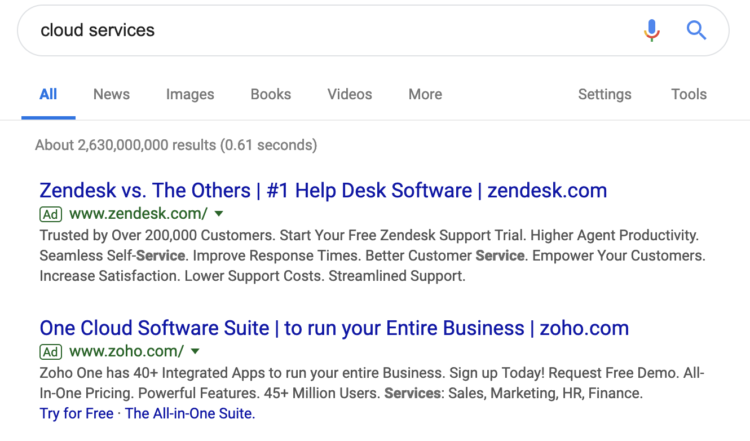 Notice the “Ad” icon in green to the left of each SERP. Both display and native advertising models involve pay for ad placements. The primary difference is in the nature of those placements. Display ads impose themselves on the content and native ads embed themselves within it. Display ads typically use action-oriented language (e.g., “Try SEMrush™ for Free”). Native ads might have a softer sell and take a more informative or entertaining tone that’s aimed at generating traffic. Naturally, native advertising has a much higher click-through rate than display ads – 0.2 percent compared to 0.05 percent. This is partly because native ads blend more seamlessly into their environment than their gauche counterparts, and also because native ads are not usually as aggressive. The ad was wildly successful by today’s standards, with a 44 percent CTR in the first four months, according to The Guardian. Today, “banner” is the Interactive Advertising Bureau’s (IAB) nomenclature to describe any ad that is 468 x 60 pixels. The IAB is full of more terms like this: Leaderboard is 728 x 90, square is 250 x 250 and wide skyscraper is 160 x 600. All of them denote different dimensions of ad formats, despite “banner’s” use as a catch-all to describe most display ads. Display ads are most frequently used in remarketing or retargeting campaigns. This involves segmenting visitors so that a returning user who previously showed interest in a particular product or item will be presented with a related display ad. Targeting by website using Google’s Display Network is another common tactic, but it can get very complicated very quickly. It also means that you’re competing with other brands in a process called real-time bidding. The highest bidders typically get more impressions on websites that are favored by your target audience. It doesn’t help that Google makes it super easy to spend more money, which makes sense – they want the ad revenue. Even the biggest names in business struggle getting the right ads in front of their target audience, and the process can turn into a money pit if you’re not careful. Pay per click (PPC) search engine marketing: Paying Google to show up on the top of search results for certain keywords. Sponsored social media posts: Paying a social media channel to promote posts to users who may find said content relevant; for instance, promoted tweets on Twitter. Screen shot from popular technology news source ZDNet. You may have also heard the phrase “programmatic native advertising.” All this means is that analytics are used to understand context better in order to improve the placement of native ads so that they’re more likely to be presented to the right audience at the right time and place. We already noted that CTR is higher for native ads, which is promising from a lead gen perspective. Native ads also tend to be more cost-effective. However, contextual targeting and retargeting display ad campaigns, when successful, are more conversion-centric strategies. This is because they’re typically more targeted to leads that already have purchase intent. You wouldn’t click on a display ad unless you were seriously considering buying whatever was being promoted. Contextual targeting and retargeting display ad campaigns, when successful, are more conversion-centric strategies. Nevertheless, somewhere between a quarter and 40 percent of all internet users today use ad blockers. Furthermore, 84 percent of millennials are distrustful or traditional advertising (including display ads). Then there’s the issue of banner blindness. While some people actively remove ads from their experience, many others subconsciously ignore them. Displays are particularly susceptible to this selective attention, but native ads and sponsored content are not entirely immune, either. Users today, especially millennials and Gen-Xers, can spot digital advertising from a mile away. This speaks to a larger trend in marketing as a whole, which is the slow but sure death of interruptive strategies. Those of us who aren’t desensitized to ad content are annoyed by it, and actively evade or conceal it. If your content feels like marketing, then you’ve already put yourself at a disadvantage, native or not. And what about content syndication? Content syndication involves re-publishing branded content on third-party sites. This is done mainly to expand your audience. You can get more eyes on your content if you post it to multiple online sources. If those sources have strong domain authority, and they link back to your website or blog, you can improve your own domain authority. The added brand recognition is also a big plus. Reposting your company’s blog content to channels such as Medium and LinkedIn Pulse is called self-syndication. It might not bring you the same results as getting re-published in a prestigious industry magazine, but it can help you generate more traffic. Content syndication is not the same as guest blogging. Nor is it the same as creating a sponsored article for an online magazine or industry news source. It is not, for all intents and purposes, a form of advertising because it does not involve paid placement. CNN isn’t republishing the content on its site, but rather just linking to the original source of the articles. The fact that “content syndication” is frequently used to describe two entirely separate things is admittedly confusing, and one of the unfortunate quirks of modern marketing lingo. So to keep it simple: Paid content syndication is a form native advertising, and a somewhat spammy one at that. The O.G. content syndication, on the other hand, is not advertising, but a form of organic content distribution that generally aids SEO. Paid content syndication is a form native advertising, and a somewhat spammy one at that. The O.G. content syndication, on the other hand, is not advertising, but a form of organic content distribution that generally aids SEO. Where does content marketing fit into this dynamic? Although often referred to as such, content marketing is not a form of native digital advertising. Technically, so is display advertising. Content – as it pertains to content marketing – is a form of owned media. You’re not paying for its placement on your own website or blog (or in the case of unpaid content syndication, someone else’s website or blog). It lives there. Perhaps you can get away with calling it native marketing if you so desire, but it’s not advertising. Yes, digital advertising does overlap with your content marketing campaigns in the sense that it can be used to promote and distribute content. And a good deal of marketers use these paid tactics in addition to, say, organic social media marketing, successfully. Are we splitting hairs? Maybe a little, but these distinctions are important for understanding what content brings to digital marketing: the pretense of no-strings-attached value. A few well-placed native ads, or some clever display ads, may earn you some clicks. But high-quality content will earn you trust. You need both to succeed at digital marketing. Content management software: What is it and why should you care?